The picture above shows the items I received in the mail a few days ago. Maybe it’s because I’m a writer, but I couldn’t help noticing the combination. 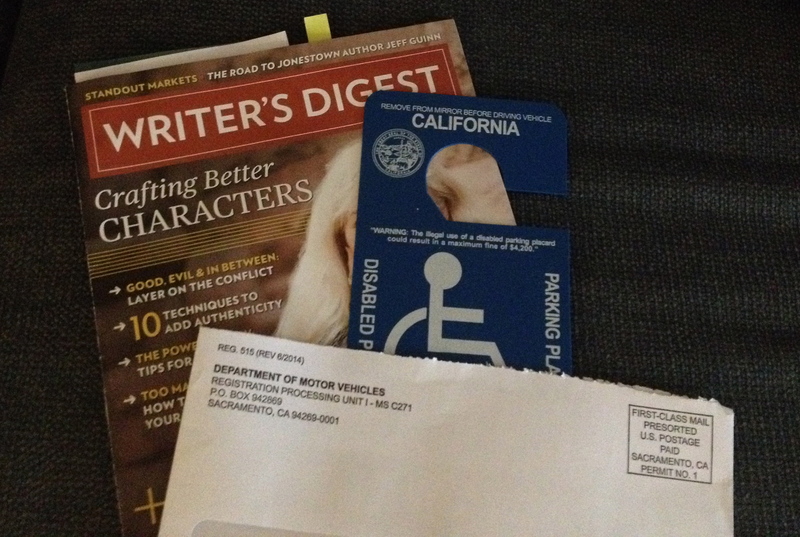 My Writer’s Digest magazine — a subscription I’ve had for a few years now. I read each issue, marking pages with Post-Its, highlighting passages, reading it as a writer looking for information and inspiration. Because since I am no longer a teacher (because of a disability), I am a writer. The other item, my disabled placard, is one I’ve had mixed feelings about for quite a while. I’ve been vehemently opposed to getting one and worried that I wouldn’t even qualify for one. Although, as my husband pointed out, I’m no longer teaching due to my disability, and I receive a monthly disability check, so it really wouldn’t be a stretch to think I’d qualify for a placard. But the placard is such a visible sign that there’s something wrong with me. And I still believe there are others who need it more than I do. But lately, there have been times I’ve really felt like I needed it too. Like the day we parked several blocks away from my rheumatologist’s office to save money by not parking in the building’s parking lot. We weren’t sure how long we’d be so I opted out of an hour-only metered spot. A disabled placard would have made finding a parking spot much easier. I haven’t used the placard yet. I haven’t even put it in the car yet. But I will. And one day I’ll use it. And that will be it’s own essay.